“It is shocking that mainland Indians, even progressives are not opposing it. They should oppose it. They have left it to Northeast people to oppose. The citizenship amendment act is the first law in the country which actually declares that Muslims are not natural citizens of India,” notes Bhartiya in light of the silence of mainland India over the Bill. The citizenship amendment bill of 2016 seeks to provide citizenship to non-Muslim immigrants from Bangladesh, Afghanistan and Pakistan if they have been residing in the country for 6 years instead of 12 (as provided by the citizenship Act of 1955) through the process of naturalisation even in the absence of required documents. Assam had witnessed a 6 year long anti-foreigner agitation from 1979-1985 following which the Assam Accord of 1985 was signed. As per the Accord, foreigners entering Assam after midnight of March 24, 1971 shall not be conferred with citizenship irrespective of religion. Despite protests from the opposition, the bill of 2016 was passed in the Lok Sabha on 8th January 2019 in the last full session of the 16th Lok Sabha before the Lok Sabha polls. Following the move, the 8 north-eastern states witnessed a bandh called for by the North Eastern Students Union (NESO) on Tuesday. There were reports of clashes between the police and protestors against the bill. “This Bill will not only harm the secular fabric of the country but also affect the linguistic and ethnic identity of Assam. It will change the state’s demography and might turn the Assamese and other indigenous communities into a minority,” says Teresa Rehman, ex-journalist from Tehelka magazine and Editor of The Thumb Print, a contemporary news magazine from Northeast India. Of the 3.3 crores of people who applied to be included, almost 40 lakh people have been left out of the final National Register of Citizens draft published on July 30 of which 14.8 lakhs have filed claims. 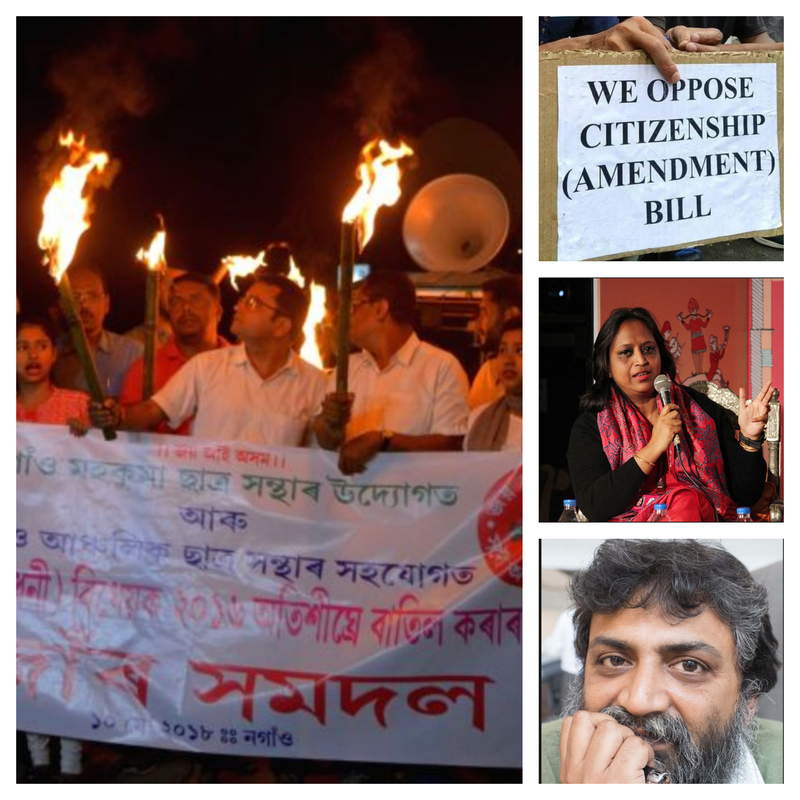 As per the Bill, the Bengali Hindus amongst the left out shall be granted citizenship while the excluded shall be rendered stateless meaning they shall be governed by the Foreigners’ act of 1946 which gives the State extended powers to detain or deport these individuals. “In spite of large scale protests in the North Eastern States against Citizenship Amendment Bill of 2016, BJP led NDA pushed through the bill in Lok Sabha. Experts assert, this amendment is designed around the idea of India as a homeland of just Hindus. For the states in the North East of India, where small communities have faced dispossession and cultural challenges because of both internal and external migrations, a law like CAA is feared. Moreover, this Amendment is also a discriminatory law against Muslim inhabitants and can caste aspersions to the community. “This bill has been a long term plan of BJP/RSS to fold India’s North East into its Hindutva project. Thma U Rangli Juki (TUR) stands for the secular, democratic, pluralistic and federal India, where rights of small indigenous communities are respected and their control over their land and resources is not interfered with. TUR is in solidarity with various progressive political groups who are protesting against this communal and divisive law while also reminding the people that to fight against this law should also be a fight rooted in defence of rights of minorities for protection under all humanitarian laws. TUR appeals to all regional political formations who are in alliance with BJP, to break such contacts so that the poisonous Hindutva politics has no role to play in the multi religious, multicultural region of ours,” says Thma U Rangli- Juki or TUR, a community of people from different walks of life focusing on issues of the common man in the state of Meghalaya. In the past two and half years, BJP fastened its hold on northeast region, its first acquisition being Assam. Later, it went on to form governments in the states of Arunachal Pradesh, Tripura and Manipur. It is also part of the ruling coalitions in the states of Meghalaya and Nagaland. Following disagreements over the bill, the Asom Gana Parishad (AGP) withdrew support from the ruling government in Assam. The National People’s Party led government in Meghalaya, of which the BJP is also a part, passed a cabinet resolution against the bill. Mizoram government also opposed the Bill with chief minister Zoramthanga extending support to the shutdown on Tuesday. In Tripura, the Indigenous People’s Front of Tripura (IPFT), which is a part of the BJP-led government, stands in opposition of the bill. In Nagaland, the Nationalist Democratic Progressive Party (NDPP) led government, of which the BJP is a part, the state cabinet on Tuesday resolved to urge the Centre to review and examine the bill to ensure that it is in consonance with provisions of the constitution. “Basically, the citizenship amendment bill 2016 is RSS-BJP’s dog whistle politics. Nothing great is going to happen after the amendment happens but what you have done is that you have declared India a Hindu country. You are saying that everyone else has a right to return to India except for Muslims. You are using this bill to draw that line. In North-eastern regions, historically, the nationality question has been more important than the question of religion. People from Northeast do not like migration from anywhere, be it from India or from outside. They are a smaller community and they can be overwhelmed. The opposition to citizenship amendment bill is also coming out of that. Bengali Hindus would be allowed straight away to get citizenship. Everyone has opposed it including the chief minister of Meghalaya and the chief minister of Mizoram, both a part of NDA. BJP-RSS does not want to hear anything. They just want to push through something which is not in the interest of the North-eastern region. Fundamental basis of any nation-state is citizenship, who can be a citizen and who cannot be a citizen. Citizenship in India has been a very secular thing; anyone who was born in India and anyone who has come to India and wants to apply for citizenship, there is no religious basis to it. This is the first time in the history of India that a religious basis for citizenship has been made,” says Tarun Bhartiya, documentary filmmaker and a member of RAIOT Collective. While the centre is aiming to heighten it’s Hindutva ideology and its vote bank by roping in Bengali Hindus, earlier more aligned towards Congress, the general animosity against the centre within the Northeast communities can negatively impact their prospects for the upcoming Lok Sabha polls as it has 25 Lok Sabha seats of which 14 are from Assam, 2 each from Meghalaya, Tripura, Manipur and Arunachal Pradesh, and 1 each from Mizoram, Nagaland and Sikkim. Speaking of the history of self- determination movements in the North-East, Bhartiya explains, “RSS has had old presence in Assam and many other places. They have had an ashram and all those kind of things. BJP has also won one or two seats in Meghalaya, they have won one or two seats in Manipur, but they have always operated through regional parties. Fundamentally, the self-determination movements in the Northeast has always been trouble for these Hindutva people. But even when Congress was in power, it wasn’t much different. After being passed by the Lok Sabha on the 8th, the bill was forwarded to the upper house of the Parliament, the Rajya Sabha. However, the Rajya Sabha was adjourned without any proceedings till Wednesday. However, the issue couldn’t be tabled in the upper house on Wednesday either.